Humans are curious by birth. Guiding questions, objective experimentation and persistence till we arrive at a convincing theory leads the curiosity to discoveries, inventions as well as a better understanding of the world around us, thereby making our life richer. ISPF & ThinkTac are on a mission to enrich the life of every child by making scientific temper a part of their character. The key step in this mission involves rekindling the scientific temper in every teacher/mentor. When equipped with the tools to make children think, a teacher can ignite and nurture the scientific temper inherent in children. The TACLearn™ Teacher Training Programme has been designed by keeping the above objective in mind. The programme will be valuable for teachers who are hungry to find new and innovative ways of making science more engaging. While TACLearn equips the Educator with a range of knowledge and skills required to deliver the ThinkTac programmes, further study of the material specific to the science curriculum being used is essential to facilitate the full range of TACtivities. We have full-time and part-time opportunities for educators at partner institutions and as a educator in our programmes. Educators can also partner with ThinkTac to setup a centre serving their local community. Any Science or Education graduate can undertake this programme. Teaching experience is preferred. It is designed as an immersive, hands-on, 18 hours programme spread across THREE days. Since the focus of the programme is on the pedagogy instead of the content, it would be relevant for primary school, secondary school and high school science teachers working with children as young as seven. This also implies that the teachers need to be have a basic understanding of the sciences. Each participant will be provided a kit containing the material for 10 tactivities. The first two days would focus on kindling the scientific temper in us by following the TACLearn methodology. The TACLearn methodology has experience at its core, with the participant experiencing a phenomenon through a TACtivity. He/she then makes a set of observations by asking questions and conducting a few experiments. This is followed by making variations to the model or conducting the experiment by changing any one variable. 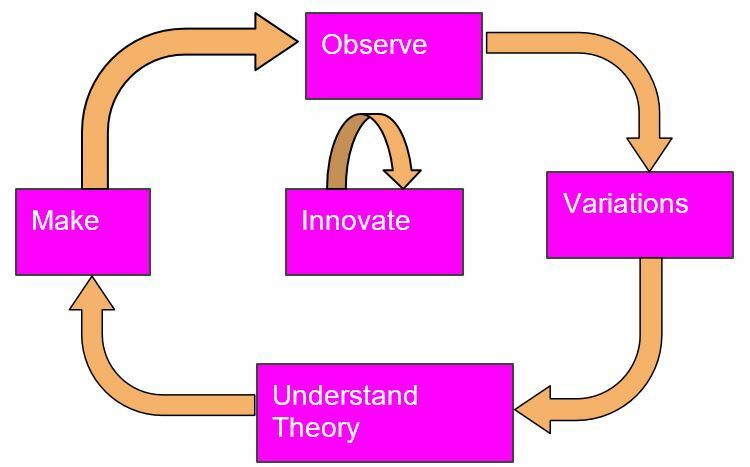 This exercise of observation and exploration through the variations usually leads to some hypothesis for the underlying phenomenon. The participant then repeats the process by working on another TACtivity related to the same phenomenon and in the process, refines his/her hypothesis. During the first two days, participants experience the above methodology by working on six selected TACtivities. The observation questions and variations for each of these six TACtivities would be given to them. Through their observations and variations, they would come up with their own hypothesis for these TACtivities. Can you imagine that Newton’s laws of motion stop working when you haven’t taken a bath in the morning? Or that our lungs start absorbing nitrogen along with oxygen and our body starts making amino acids from this nitrogen so that we stop needing protein based diet in our food. Or that water and mercury swap their molecular property of adhesion to other molecules so that water becomes completely non sticky and hence, umbrella and towel industry goes down overnight. Fortunately the above examples are ridiculously hard to imagine. The laws of science are impartial to the context and usually work the same way across years and at times across ages. Those who will be part of the TACLearn Teacher Training programme including the ThinkTac/ISPF trainers, need to remember that their key role is science education and not science research. While a science educator needs to be as enthusiastic about science as a science researcher, he/she has to wear two caps at the same time. The second cap happens to be of a science communicator, a teacher, someone who understands the world of children, someone who understands how learning happens, someone who knows some of the most effective ways of communicating science to children. Given this second requirement, it is important that the training programme touches upon the fundamentals of education as well. The ThinkTac/ISPF team believes in few fundamentals about education. These fundamentals have been captured in the form of three laws of learning. ThinkTac team believes that these laws work as consistently across different contexts as the laws of science. The last session on the second day would focus on introducing the three laws of learning. Each of the first two days would end with a homework which the participants are expected to work on the same day. Each homework may require an investment of 45 mins to 1 hour. Select two tactivities out of the remaining four tactivities (kit contains 10 tactivities out of which 6 would have been executed). After the three days’ programme, the participants go back to their respective school/learning centres and execute the two tactivities within a duration of one month. The participants share the photos and videos of these sessions with the ThinkTac team. Note: If the participants need material for delivering the TACtivities, ThinkTac can provide the material for upto 40 children on receiving a letter from the school/learning centre. Each participant would receive a certificate if he/she attends the full 3 days’ programme and completes the assignment satisfactorily. This would also make them eligible for running a ThinkTac/ISPF programme as a freelancer or at a school/learning centre/local community. In the cases where a partnership with the school/educator materializes, ThinkTac team would actively work with the educator to make their & their children’s experience with the TACLearn methodology richer.